Q: Some suddenly talked to me during practice, how to deal with it? Q: During qigong practice, some suddenly talked to me, but after that, I felt not so good. In such case, how to deal with it? A: In this case, we need to practice our own ability to respond slowly. Practicing qigong is to strengthen the stability and reactive ability (the ability to cope with external stimuli), and to enhance sensitivity and reactive response. Hence, when such situation is encountered, just have that concept in your head: I cannot immediately go to cope with him or her and I need to restrict myself. Get the consciousness to the dantian area, and then go to talk. 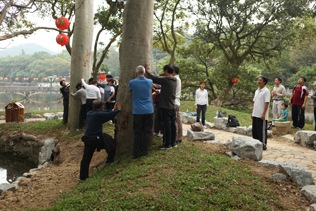 Last text: Q: What to do when we get frightened during qigong practice? Next text: Q: What are the general guidelines of practice in daily life?